My fondest bread memories are from my childhood days. My maternal grandparents lived in Karanpur, a village in district Udham Singh Nagar which now falls in Uttarakhand. The village was inhabited by Punjabis who’d crossed-over after partition, leaving everything behind in Pakistan. Despite the LPG cylinders and gas stoves in the kitchens, every house had a clay tandoor in its veranda. In the evenings, the womenfolk of the house would fire up the tandoor and slap thick rotis on the inside of its wall. The rotis, with charred edges, would then be smeared with home-made ghee or white butter. On the days we were visiting, as a special treat for my sisters and me, the rotis were pressed on chopped onions before being stuck inside the tandoor. We would happily give up a full-fledged meal made at home for these onion rotis doused in ghee and sprinkled with salt and chilli powder. Back home in Gorakhpur, during school days, commercial white bread made regular appearances on our breakfast table. In Lucknow bun-makkhan – sweet and soft bun with white butter was a breakfast staple; with a samosa sandwiched between two buns, it still makes for a perfect grab and go meal. Coming back to white bread, crisp toast with a slathering of Amul butter with fried eggs or omelette was an all-time favourite. At times we would spread fresh malai over the bread, sprinkle some sugar over it and eat multiple rounds of the simple delicacy. I don’t have the heart to eat the calorie loaded sandwich anymore. Somewhere around late 90s, ready-made pizza bread made its entry into the market and there were weekends dedicated to pizza dinner. Topped with home-made sauce, onions, tomato, capsicum, grated paneer, grated cauliflower and cheese, this pizza was nowhere close to the gourmet ones available now but was a meal we waited for with bated breath. Around five years ago, when I started writing about food, I was exposed to vast world of breads. Trying artisan breads, especially at The Baker’s Dozen, made me understand that how unhealthy and uncharacteristic the white bread was. That triggered the love for baking breads in me which started with making my own pizza base. As I moved to more complex breads, it was Saee’s blog myjhola.com that came to my rescue. Her recipes were simple with no technical jargon to make things complex. I baked my first perfect challah – Jewish Sabbath bread, following her recipe. A few weeks ago, when I was struggling with multi-grain dough, Saee gallantly rescued me with a recipe that she shared on Twitter. Also Read: All You Need is Loaf! Saee’s book, Crumbs! 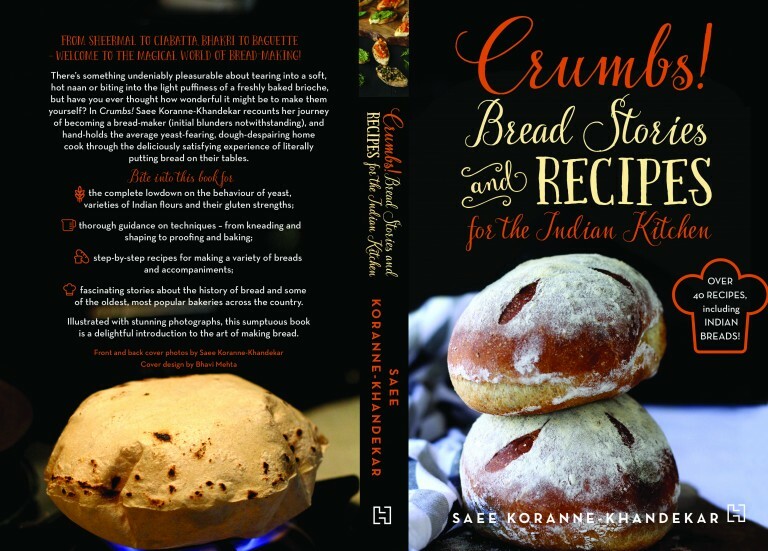 Bread Stories and Recipes for the Indian Kitchen, is a collection of around 40 simple and complex, leavened and unleavened breads. There’s a huge repertoire of Indian breads along with European breads and the recipes for the latter have been modified to suit the Indian kitchen, weather and availability of flour. 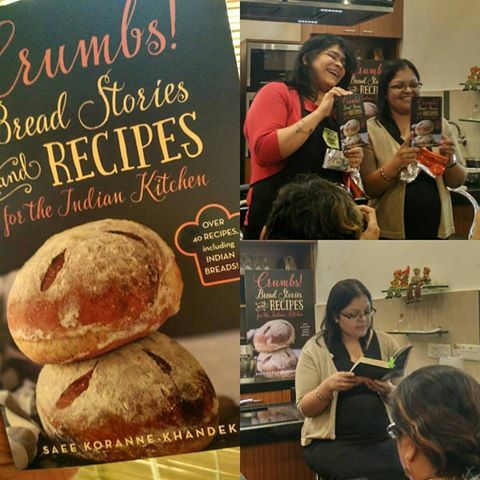 Crumbs begins with the history of breads 10,000 years ago and demystifies a number of breads; be it roti, bhakri, Goan poee or the mysterious sourdough. Crumbs handholds you through the entire process of bread baking talking about various kinds of yeast, flour, techniques and tools required. The recipes are peppered with Saee’s stories, anecdotes from her childhood and personal experiences as a baker. The stories are so beautifully told that I could actually feel the aroma of a simple bhakri being cooked in Bhimawwa’s little hut or felt the sweat trickling down my brow as Saee stood in Mr Pinto’s bakery watching poee’s being thrown in the oven with perfect precision. Crumbs will instantly fill you up with this craving to get in the kitchen and bake a perfect loaf. I’d say follow that instinct and bake.